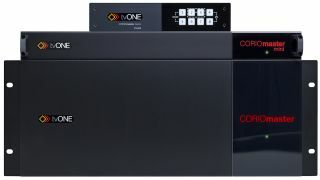 The What: tvONE is now shipping new enhancements to its CORIOmaster (4RU), CORIOmaster mini (1RU), and CORIOmaster micro (1/2 RU) video wall processors. The What Else: The enhancements include a secure communication suite with full REST API and multi-user control. Other improvements include an HDMI four-port output module (CM-HDMI-SC-4OUT), audio support for the CORIOmaster and CORIOmaster mini for embedded audio, and a dedicated audio module (CM-AUD-2IN-4OUT). Secure communication allows system installation to be compatible with all secure network infrastructure environments. The HDMI four-port output upgrades the C3-540 CORIOmaster to up to 56 outputs, making massive video walls, projector edge blends, and LED installations easy and smooth. The embedded audio support and new audio module improve CORIOmaster performance for both video and audio in an installation. The IP streaming module now accepts both H.264 and H.265 (HEVC) for higher quality, increased bandwidth performance, and includes an ultra-low latency mode. The Bottom Line: The CORIOmaster range of products can manage up to four canvases for supporting multiple video walls, while also performing various other video tasks simultaneously, including audio, real-time 360 video rotations, multi-image processing, and rotation and edge blending. To download CORIOmaster & CORIOmaster mini's latest firmware update, please click here.